These little things have been everywhere lately. It’s the new trend to sweep the nation. Go to the gas station; they are there. Look online, there they are. Go to steal money from grandpa’s wallet, and he is playing with one. They are everywhere!! I’m sure you are well aware of these little devices if you have spent any amount of time online in the last couple of months. They are small enough to fit into the palm of your hand. Cheap enough to buy with the money you find in your couch And so simple it’s somewhat crazy. They are typically plastic devices – although the metallic versions are increasing in popularity due to their faster and smoother spins- that come in a variety of shapes. They work thanks to a rotatable component in the middle that usually uses metal bearings to allow the user to spin the devices between their fingers. The spinner’s primary use is to fidget with, which makes the name of it make a lot of sense. They were created by a Florida woman named Catherine Hettinger, who suffered from myasthenia gravis. Basically, she suffered from muscle problems and wanted to make a toy she could share with her young daughter that didn’t require much pressure or strain on her muscles. So instead of playing video games like everybody else, she decided to invent the fidget spinner in the early ’90s. She eventually filed the paperwork to protect her invention in 1997 and even had a deal worked out with Hasbro! Sadly, the deal with Hasbro fell through, and she hasn’t made a cent from her invention. Catherine didn’t have the money in 2005 to re-file the patent on her design, meaning that after that point anybody who wanted to could take her idea and sell the devices, which is what is currently happening. So why in the hell is this little thing so popular? Although they may or may not help kids with specific issues, the popularity of the device has lead to their mass use on school grounds across the world, which in turn has led to numerous bans and teachers confiscating the toys. But the biggest reason behind the popularity of the fidget spinner is the trend. They have become popular, which has caused more people to get them and use them, which caused more to do the same, and before we know it everybody and their weird uncle has one in their hands. So there you have it. What was once an invention that was created in the ’90s eventually became an idea that everybody stole to start a strange trend that has swept the nation. Where can you buy a fidget spinner? Instead of looking for a store near you, why not place your order online at Amazon? 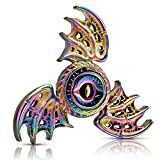 If you’re wondering how much does a fidget spinner cost, check out the following review where you will find six of the best fidget spinners you can get today. 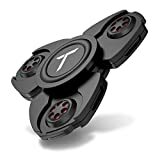 Each Tornado golden orb fidget spinner has been tested to ensure that it has the optimal weight and balance, and is made from the finest quality materials. 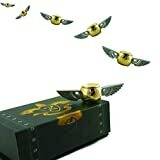 The fidget spinner is made of brass and comes in a beautiful Medieval chest box with a magnetic lid to keep the spinner securely in place. If you are giving this spinner as a birthday or Christmas gift, there is an inner flap incorporated in the design where you can add a personalized message. This spinner is perfect for the Harry Potter fan in your life. Previous buyers have reported spins of over one minute and are delighted by its excellent craftsmanship. Perfect for work, play, and relax, the Trianium spinner is the ultimate stress reliever. It provides long-lasting, smooth spins which help reduce stress, quit bad habits, and maintain focus. It is made of durable metal-alloy and uses high-speed ceramic bearings for even faster and longer spin times. Amazingly smooth spins, compact design, nearly silent, and very sturdy feeling. All of this in one single fidget spinner. If you want more bang for your bucks, this is an option for you. 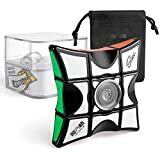 Not only is the D-FantiX a spinner, but also a fidget puzzle similar to a Rubiks Cube. The spinner is designed to fit into a 1x3x3 cube. Its smallness, portability, and safety allow you to release stress under any circumstance. There are ten steel balls inside every corner piece help move it faster and with excellent stability. The gyro bearing is hidden in the centerpiece to provide a good grip. This fidget spinner includes a convenient carry bag to take it wherever you go. The layers turn with a little effort and have a satisfying click at the end, with turns that are very smooth. Forget about those flimsy, cheap spinners you can get for a buck. Why not spend a bit more and get yourself a sturdy item that will last ten times longer? 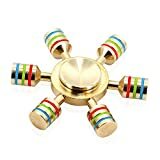 This fidget spinner is made with a heavy-duty brass body and uses a stainless steel bearing. It definitely feels like a real hammer would, with a proper distribution of weight. 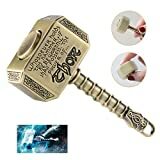 On the sides, it has the following text engraved: “Whosoever holds this hammer, if be worthy, shall possess the power of Thor.” Perfect for Marvel COmics and Avengers fans! The best part is that it spins smoothly, and you can remove the handle and spin just the top part. This spinner comes in a small carrying case to protect it from scratches. With a weight of 2.6 oz, you know this fidget spinner is high-quality. It is made of brass and uses eight stainless steel bearings to keep it spinning for over 4 minutes at a time. Red, green, and red stripes on each golden bar give it a colorful rainbow effect while spinning. One feature that makes this spinner stand out from the rest is that you can remove any of these bars. Quickly turn your fidget spinner into a dual-bar or tri-bar and experiment with the different spinning and balancing options you’ll get. Solid craftsmanship and sturdy construction. Definitely worth the extra to get something non-plastic and a little more unique. Overall, an excellent product. The body is made from a metal alloy and uses saintless steel bearings for excellent grip and controlled spins, with fast, smooth and quiet spins all the time. It comes in a beautiful, little, round, zippered, sturdily made box with a small net pouch sewn into the top, and a small screwdriver in case you need to open it up.